Complete kit with Fusion MS-RA55 marine stereo and 2 x 6 "white EL602 150W speakers. Fusion MS-RA55 is a very compact marine stereo system that has built-in Bluetooth and support for two audio zones with two speakers each. The stereo is Fusion's unique and elegant True Marine design and is waterproof to IPX5. With the built-in Bluetooth feature has the ability to stream any audio from a smartphone or other electronic devices that support audio playback via Bluetooth. For RA55 is a bracket that MS HUGMS for installation in smaller vessels where it is not possible to trap it in a panel. This is a optional accessory avaliable instore. Amazingly Simple Control: Most functions are controlled by the large rotary encoder. 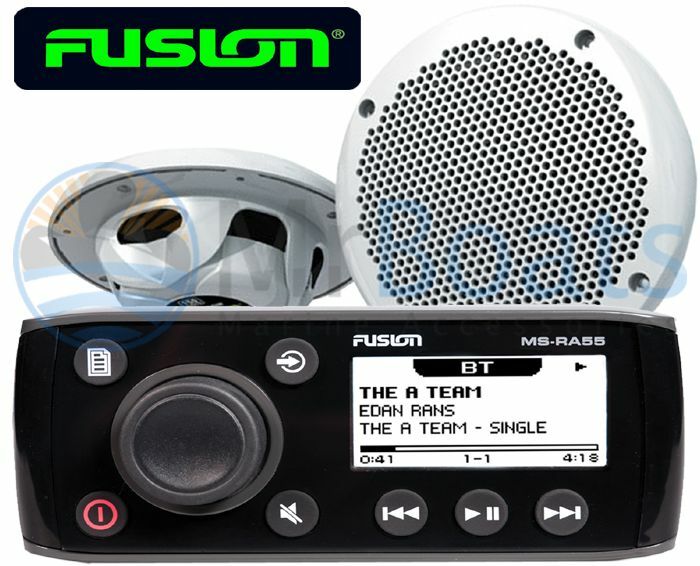 MS-RA50 incorporates FUSION's easy to use user interface found in premium models. 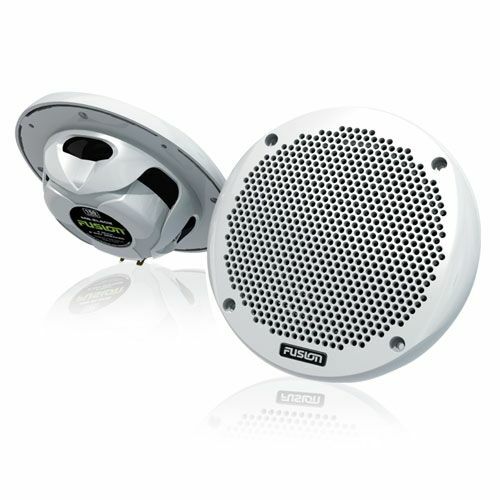 Single Zone System: Able to power a single set of speakers, perfect for smaller vessel. The MS-RA55 also has a Left & Right AUX In Connection and a Left & Right Line out, allowing for amplifier connectivity. The best entry level option for marine entertainment, backed by Fusions’s True Marine 3 year limited consumer warranty. Easy to Use: Nearly all operations are controlled through the large rotary encoder, ensuring Fusion’s True Marine interface is simple and easy to use. Information and text is easily readable, even under direct sunlight on the large 2.3” LCD display. Complies with IPx5 water resistant standards and equipped with a rugged electrically isolated aluminium die cast chassis, to maintain isolation between battery negative and the hull of your metal boat. The chassis of the MS-RA55 acts as a heat sink for the entire stereo, removing the need for an external cooling fan.